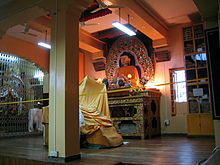 Dalai Lama (UK: /ˈdælaɪ ˈlɑːmə/, US: /ˈdɑːlaɪ ˈlɑːmə/; Standard Tibetan: ཏཱ་ལའི་བླ་མ་, Tā la'i bla ma, [táːlɛː láma]) is a title given by the Tibetan people for the foremost spiritual leader of the Gelug or "Yellow Hat" school of Tibetan Buddhism, the newest of the classical schools of Tibetan Buddhism. 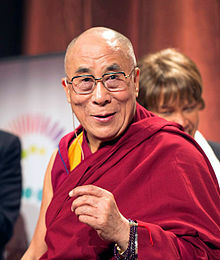 The 14th and current Dalai Lama is Tenzin Gyatso. 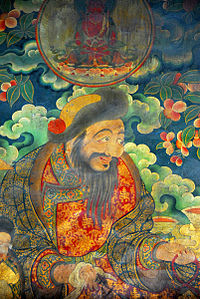 From 1642 until 1705 and from 1750 to the 1950s, the Dalai Lamas or their regents headed the Tibetan government (or Ganden Phodrang) in Lhasa which governed all or most of the Tibetan Plateau with varying degrees of autonomy under the Qing Dynasty of China, up to complete sovereignty. This Tibetan government also enjoyed the patronage and protection of firstly Mongol kings of the Khoshut and Dzungar Khanates (1642–1720) and then of the emperors of the Manchu-led Qing dynasty (1720–1912). Tibet's sovereignty was later rejected, however, by both the Republic of China and the current People's Republic of China. ^ 陈庆英 (2005). 达赖喇嘛转世���历史定制英. 五洲传播出版社. pp. 106–. ISBN 978-7-5085-0745-3. ^ Regina A. Corso (29 May 2013). "The Dalai Lama, President Obama and Pope Francis at Highest Levels of Popularity in U.S. and Five Largest European Countries". New York: Harris, A Nielsen Company. Archived from the original on 10 September 2017. Retrieved 9 September 2017. 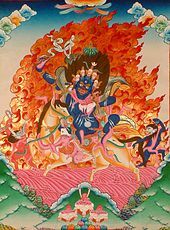 ^ "Dalai Lama Group Says It Got Money From C.I.A." The New York Times. 2 October 1998. ^ Burke, Denis (27 November 2008). "Tibetans stick to the 'middle way'". Asia Times. Retrieved 7 August 2010. ^ "Dalai Lama says 'Europe belongs to Europeans'". France 24. 12 September 2018. Retrieved 14 September 2018. ^ "Dalai Lama contemplates Chinese gambit after his death - Times of India". The Times of India. Retrieved 19 March 2019. ^ a b c d "The Dalai Lama". BBC. 21 September 2006. Retrieved 17 May 2008. ^ "The Dalai Lama's Succession Rethink". Time World. 21 November 2007. Retrieved 6 April 2013. 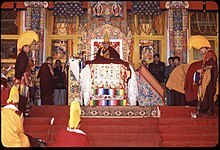 ^ "Dalai Lama's confirmation of reincarnation". 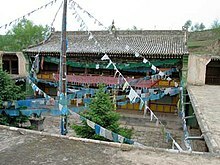 Tibet Travel info. Archived from the original on 31 March 2008. Retrieved 17 May 2008. ^ Bindley, Katherine (24 April 2013). "Dalai Lama Says He Would Support A Woman Successor". The Huffington Post.